By Peter Anderson 17 Comments - The content of this website often contains affiliate links and I may be compensated if you buy through those links (at no cost to you!). Learn more about how we make money. Last edited February 10, 2017 . One thing that I've been a huge proponent of on this blog is finding ways that you can create income on the side to help turbo boost your progress towards reaching your financial goals. That's only the tip of the iceberg, however, there are a lot of other things I do. Creating side incomes is a second full time job for me! Today I thought I'd talk about another thing that I do to generate income online. I create and sell my own e-books! In this post I'll walk through the process of creating an ebook from start to finish, talk about the tools you'll need to use, things you'll need to do to promote it, and how to keep it generating income for months to come. What Tools Will I Need To Create My E-book? 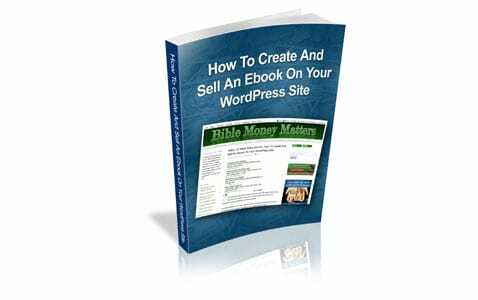 How Much Can You Make Selling Your E-book? It's a great way to create incremental income to add to your bottom line. Once it's created, it can continue generating revenue for as long as the information remains relevant. A great way to share valuable information that you know. Different medium and another place to build your brand and message. Having an e-book on your subject matter helps to build your image as an authority in your subject matter. It's cheaper and easier than publishing a hard copy of your book. Free e-books are a great bonus to get people signed up for your email lists and site feeds! There are probably a thousand other reasons to create an e-book, but if you're looking to build an online brand, and you want to find new ways to create income, it's a great way to do it. A lot of people think that creating an e-book isn't something they could do because it would be too expensive to buy the tools they need to make it. Here's the thing though. You can create your e-book using open source and free software, and still have an amazing looking final product. I did! It doesn't have to cost you a dime! So here are some things that you'll need to create your e-book itself. To write the content of your e-book you can use just about any word processing software. Seriously. The only proviso is that for the finished product for your e-book you're usually going to want it to be a .pdf formatted file (portable document format). Not all word processing software will allow you to save or export your file as a .pdf. If it doesn't, there are options out there for you to be able to convert your file to a .pdf. It just depends on what program you're using. Personally I used a free open source software called OpenOffice.org to create my e-book, and it is what I would recommend using. 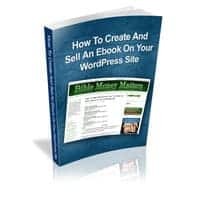 It has everything you need to create the e-book including page styles (so i could create a cover and pages background for all the pages in the e-book), formatting options, linking ability, and of course – it allows you to export your file as a .pdf. Why go through extra conversion steps when you can just use Open Office and export a nice final product? When you're creating your e-book you're most likely going to want to create images to have in the e-book including a cover, header and footer graphics and other images to include in the content to make it more visually interesting. You'll also need an image editing software to create graphics for your landing page that you'll be creating later on in this tutorial, as well as for promotional ad banners you can send to affiliates. LogosForWebsites.com: My graphic design site – affordable and you'll get some nice graphics! Upwork Contractors: Use Upwork to hire a contractor to create graphics for you. Buy Pre-Made Graphics: Do a google search for the type of graphics you want, and you'll be able to find pre-made graphics you can customize, or software that will automatically create your graphics for you. Putting together your e-book is going to be a lot of work, I promise you. If you do it the right way, however, it will pay off in the end. So where do we start once you've chosen your tools? Choosing your topic of course! When you're trying to come up with a topic for your e-book, it's probably best to write about something that you have quite a bit of knowledge on, or something that you can research and pull together information on relatively easily. For me the things I've written e-books about are two of my favorite topics, blogging and personal finance. I'm immersed in these topics daily, and I feel like my knowledge of those topics is pretty good. In addition I had already written on the topics, and was able to recycle some of that information to include in the e-book. Figure out what's popular on your site: I looked at what articles on my site were the most popular as far as traffic, and as far as comments. Do a survey: Ask people in a short 3-5 question survey what they'd like to read about and what topics interest them the most. Think about the typical person you're writing to: Think about the average person who might buy your e-book, and think about what kind of questions they would have, and then answer them. Do an Amazon search on a potential topic: Do an Amazon search once you've figured out a potential topic area, and see what books and topics are the most popular, and have the most comments. Read the reviews of those books to see what people are saying about the topic and what questions were left unanswered. (hat tip to Pat Flynn for this idea). The keys to choosing your topic is to choose something that will be relatively popular, and write what people want to know, not necessarily about what you want to write about (although it helps to write about something you enjoy). Make sure you write about the topic in an easily understandable way, and don't use a lot of technical jargon or industry language. Keep it accessible for all. Once you've chosen a topic, it's time to map out your topic (mind mapping) and create an outline for your e-book. After I completed my mind-map I wrote down a rough outline of my e-book and the topics I wanted to cover, based off of the mind-map. Once you have a topic, and a rough outline of what you want to write, you'll want to prepare to write your actual e-book. To do that you'll want to create your document template within Open Office or other word processor. Choose the page size: For an e-book I would normally do it as an 8.5″x11″ or 6″x9″ page, as those sizes will usually look best on most monitors. Choose readable fonts: Use a simple font without a lot of embellishment for your e-book. Readability is key, so I'd suggest something simple like Arial or Helvetica. Setup a cover page, header and footers: Since i have a graphic design background, I designed my own book cover page graphic, along with headers and footers. When you're in your document, you can set the cover page to have a background image via page styles, and then for the rest of the e-book use a background image that includes your headers/footers. Setup headers, sub-headers, bullet points, etc: When you're actually writing your text you'll want to include headers and sub-headers, and usually the formatting of that text will be different from the body of the text. The fonts will be bigger, bold and sometimes in color or with background images. Also setup what your bullet points will look like. Make sure everything fits your theme. When you're creating your document template, you may want to refer to the documentation for the word processor that you're using. It should have more exhaustive instructions on how to create page styles, setup page backgrounds and modifying page sizes. Once you've setup all these things in your template, you're ready to start writing. Writing your e-book is going to take a lot of hard work, and it won't happen in one sitting. You need to set aside time to write, time to have others edit, and time to re-write. I gave myself a deadline of one month to finish the e-book, and made time every night to write in order to finish it on time. When writing your e-book, there are several things you should try to include within your e-book. A disclaimer/copyright page: Add one of these in so that people can't use your e-book without your consent and so that you can't be held liable for actions of websites, third parties and companies you might link to within your content. Introduction: Introduce your e-book in the preface. Talk about why you wrote the book, how it can help folks, and set the tone for your content. An about page: Some people suggest including an “about the author” type page where you can connect with your readers and make the e-book more personal. You can also link to other content, sites, social media that you're a part of. Include images to make it more interesting: When writing your e-book be sure to include relevant eye-catching images and graphics within the content. Use your own photos and screen captures free stock photo sites, or clip art sites to get good graphics. Don't go overboard, however, because it can affect the size of your final .pdf file negatively. Use bullet points and side notes: Break up long pages of text by using not only graphics as mentioned above, but also bullet point lists and text boxes with side notes. Use hyperlinks: One of the great things about e-books is that they can be interactive because you can include links to outside content, other posts on your site, and to other affiliate programs. Don't go crazy with links, but if something is relevant, throw a link in there. Thank you page: It an be a good idea to include a thank you page on your e-book as well to connect with readers one last time, tell people what the next step is, promote other content or e-books, and remind people to not to share your content that you've worked so hard on. Include a picture if you have one to personalize it. There are things you should remember when writing your e-book. Save often: I can't stress this enough. You need to save your file often. There's nothing worse than having a power outage or or someone trip over a power cord, and losing 1000 words of unsaved writing. Write for your reader, not yourself: Make sure you're writing in a voice that is clear and focused on your reader. Make it easy to understand, and avoid using technical or confusing language unless you have to. Schedule time to write: I've found that if I don't force myself to write by giving myself a schedule and a goal, it just won't happen. Schedule a regular time where you can sit down and write. Export to PDF: when you complete your e-book, remember to export it to a format that most everyone can read, .pdf. If you're using Open Office there is a built in feature that allows you to export to .pdf. For other word processors you may need to have the file converted to .pdf via one of the online converters, or by having someone else convert it for you. When selling your e-book, it's often helpful to have things that you can bundle with your e-book to make it a more attractive offer. Free bonuses or limited time offers that will get people to act and purchase your e-book… NOW. Spreadsheets: If it's a e-book on budgets, include a zero based budget spreadsheet! Checklists: With my e-book I included a couple of checklists to go along with the e-book content, essentially action items they can print out. .MP3 files: With my e-book package I put together a .mp3 version of the e-book so people could listen to then e-book on their commute. This one has been pretty popular. Video Interviews Or Tutorials: Adam Baker in his new “Sell Your Crap” e-book package, his premium package includes video interviews with other popular bloggers. Templates: Is the e-book about how to write a blog post? Include a template for writing a blog post. Other E-books: Include bonus e-books. In my e-book package I included a bonus ebook with advice on blogging from other successful bloggers. As mentioned above, when I put together my e-book package, I added several bonuses. I did a second e-book with solicited advice from other experts in the field, I created 2 checklists that were relevant to the topic, and the most popular – I put together an audio .mp3 version of the e-book. It took a lot of time for me to put all those things together, but in the end I'm convinced those free bonuses helped to sell a lot of e-books. After you've created your e-book and put together a package of bonuses, you're ready to create a sales landing page. So what are the components of a successful landing page? Hint at a solution, introduce your product: Hint at what a solution to the problem might look like, and introduce your e-book as said solution. You may even want to include a graphic rendering of your e-book at this point. Offer a chance to buy: At this point some people may already be ready to buy. Put your purchase button in there so those people can. Give testimonials: Testimonials from happy users of your e-book product are worth their weight in gold. I sent my e-book to some selected blogger friends and asked if they could write a testmonial in return if they thought it was a worthwhile product. Sales video: This isn't something you have to have, but many folks include a sales video on their page with them talking, or talking about the benefits of the product. It can help to build trust. List the benefits of your e-book package: Tell what the e-book can do for the reader. For example, “the e-book will help you to get your blog earning $100/month within 6 months”. Make the offer: Offer your e-book, and tell how much it should be worth, and then tell them how much they'll have to pay. Sweeten the deal – list your bonuses: At this point you've told how much the package costs, but you want to sweeten the deal by throwing in something. Along the lines of “buy one magic chopper, get the second absolutely free!”. For mine I threw in some bonus checklists, a bonus e-book and an .mp3 of the e-book. Offer a money back guarantee: Offer a money back guarantee if they're not happy with their purchase. I did a 30 day money back guarantee. You know how many I've had to give? Zero. Give a call to action: Tell the reader exactly what you want them to do – to purchase the e-book. Give them a nice big button graphic that they can click on to buy. One thing that is so great about selling an e-book, is that once you've created the e-book package, landing page and other resources, it will basically be passive income if you do it right. So what can you do to automate the process to the point where it needs little to no intervention from you? Here are a couple of good options that I've come across. E-Junkie: Probably one of the more popular options to use in selling your e-books or other products is E-Junkie. Basically you store your e-book on their servers, put a piece of their code on your sales page, and when people click on the button they will be taken to a secure payment page where they can pay using PayPal, Google Checkout or a variety of other payment options. Once they pay, they are sent an email with a download link for your e-book package. You never have to be involved in the process! Cost? $5/month. WP eStore Shopping Cart Plugin: I considered using E-Junkie, but I wanted to do an in-house option if possible – something that didn't have monthly fees. 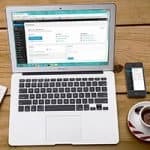 I found a WordPress plugin called WP eStore that allows you to sell your own products directly via the WordPress admin interface, and accept payments via PayPal. It allows you to have a hands off approach, just like E-Junkie. When the customer purchases your e-book and pays, they'll be automatically sent an email with a one time use download link. It will keep also keep all your sales stats, follow up emails, coupon codes, product information and more all in one place. No having to go to another website to login and see sales stats. Cost? $39.95 one time fee. One great way to promote sales of your e-book is to create an affiliate program so that others can promote your product using their own unique affiliate links. 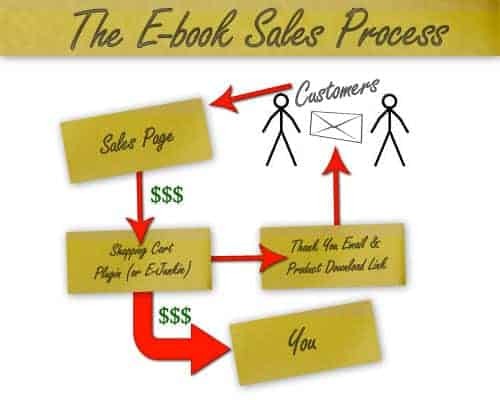 If someone purchases the e-book via their affiliate link, they get a cut, usually in the range of 20-50%. It's a great way to help promote your e-book because your affiliates can reach people that you might not have been able to. They have their own email lists, twitter followers and readers that they can reach, that you probably wouldn't have been able to. For my e-book I reached out to a bunch of other bloggers that I knew, offering a free copy of the e-book, and asking them to promote it. Create a set of banner ads that they can use to promote your product – and of course, make sure to pay your affiliates on time or they won't promote your product. E-Junkie:If you're using E-Junkie as your shopping cart and product delivery platform, it already has an affiliate program built in. Take advantage of it! Cost? Included in the $5/month fee. WP Affiliate Platform: I use a plugin that was written by the same author as the shopping cart plugin to run my affiliate program. The great thing about it is that it is built directly into WordPress, and allows me to manage it easily all in one place. Cost? $39.95, or $55 if purchased together with the WP eStore plugin. When you've got everything setup and ready to go, it's time to start thinking about how you're going to launch your e-book. Here are some things that I did to get some buzz going, and to promote the e-book even before it launched. Write about it pre-launch: Write about the e-book on your site when writing about related content. Build up to it, even mentioning how many days it is until launch..
Social media buzz: Talk about it on Twitter, Facebook and other social media, even setting up a mailing list for people to get in on launch deals for the e-book. Once the e-book has launched, you need to keep the buzz going. Guest post on other popular blogs: Bloggers are always looking for free content. Do a tour of the other blogs writing related content, and include a link or two back to your e-book sales page. Offer affiliate payouts: Set up an affiliate program and recruit other bloggers and friends to promote your e-book. Offer to do interviews with affiliates: Do interviews as an expert in the area of your e-book with other bloggers. Comment on related forums: Be a regular in a related forum, and put a link to your e-book in your signature. Offer limited time incentives, use coupon codes: During launch week or other times offer coupon codes, or limited time incentives in order to push sales of the e-book. Do mini re-launches for holidays, new versions, etc. : Find any excuse you can to re-launch the book for a holiday, because you've updated the content, or for other reasons. You can do multiple re-launches of the same product! This is a tough one to answer. You hear the stories of some folks finding a popular niche topic that ends up netting them thousands of dollars a month in e-book sales, while you hear of others who only get a trickle of sales throughout the year. I think my e-book sales have been somewhere in the middle, netting me an extra few hundred dollars here and there. While it's not enough to retire on, it is enough to make a difference to my bottom line. And when you consider that it can continue to earn passive income from month to month, it's a pretty awesome deal! The costs associated with creating my e-book? $55 for the shopping cart and affiliate plugins, and of course paypal fees. That's it! Creating an e-book is a long process that takes a lot of hard work. While you may end up pulling out a few hairs in the process, in the end, if you do it right you could end up with a money making asset that will add to your bottom line. Want to check out a list of some of my favorite e-books? Head on over to the “E-books We Love“ page. Wow, Peter! Excellent guide!!! I’m saving this for when I create my own e-book. I made one before I knew anything about styles and design, so it’s pretty boring. But even then it was a lot of work. I’m definitely looking to ramp it up the next time (and maybe even redo the first one), and your guide is just what I need (along with Pat Flynn’s). Thanks for sharing this!!! Cool writeup! 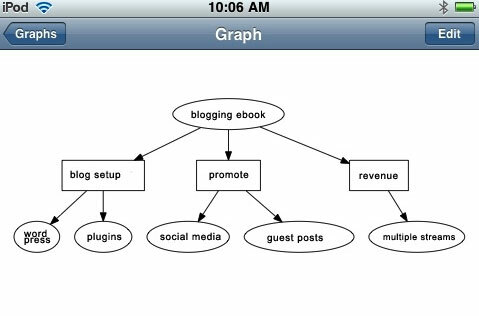 I love XMind, it’s great for mapping out blog posts and big projects like ebooks. I wasn’t sure of the whole mind mapping thing until i actually tried it. It’s a lot more useful than i thought it would be. Wow! This is a ton of information. I’ve already bookmarked it and I can see this post becoming an e-book of its own (hint, hint). I can attest to your statement that even a free ebook helps your bottom line. A good strategy that I stumbled upon was to make your ebook about something that you are already known for, or do well with in the search engines. There is a compounding effect. Good call on using free e-books as well. What a great blog post. Definitely forwarding it to a couple of my writer friends. Thanks! Wow – You could have written an E-Book just on that topic! If I ever decide to write an eBook, I will definitely use this post as a source to work from. Thanks for all the resources. Excellent article, I like those presented here for details. As a beginner, I was wondering how do you know that people want to read when it comes to online marketing? How can someone research this? How late am I to comment on this post? Hmm. I guess in the word of blogging as long as the information stays with the times, I’ll never be too late. Anyway, great post, Peter. I’ll soon be visiting your logo website for a project of mine. Having met you, and seen plenty of your work, I’d love for us to work together. Good info! It seems that an e-book is extremely beneficial. I think what’s holding me back is just fearing the whole process and never starting. Next Post: Christians And Wealth: Do They Mix?